The new Source of the Nile Bridge in Uganda is a small section of the Northern Corridor but a significant link that launches the region into the future of road transport. The smart bridge, located in Jinja Town, about 80 kilometres east of Kampala, is designed to improve traffic flow, digitally enforce axle load limits and ensure road safety. Although the bridge mainly links eastern and central Uganda, it has a bigger significance for countries that use the Northern Corridor transport route as it serves as the second gateway to the rest of Uganda, eastern Congo, South Sudan, Rwanda, Burundi and the northern parts of Tanzania. “This is a milestone in upgrading the most important trade and transport corridor, and will relieve traffic on the old Nalubaale Bridge,” said Monica Ntege Azuba, Uganda’s Minister for Works and Transport (UNRA). Launched by President Yoweri Museveni on October 17, the bridge is a dual carriageway, measuring 525 metres long and 22.9 metres wide. It was built at a cost of $125 million, funded through a concessional loan from the Japan International Co-operation Agency (JICA). President Museveni said that slow traffic, congestion, cargo overload and high frequency of accidents are some of the issues that continually concern road infrastructure planners and transport managers along the northern corridor, despite having speed and axle load control regulations in place. The East African Community continues to grapple with overloaded cargo trucks despite the regional parliament enacting a law — the East African Community Vehicle Load Control Bill, 2012 — which set the axle load limit at 56 tonnes and a maximum of seven axles for commercial trucks on the region’s road network. Fitted with eight surveillance cameras and sensors to monitor overloaded vehicles, the iconic bridge signals where road transport is headed as economies adopt digital systems to improve the lifespan of highways as well as ensure passenger and cargo safety, according to Uganda National Roads Authority board chairman Fred Omach. Engineers who worked on the project said there are two weigh-in-motion bridges fitted with cameras to take photos of all vehicles. Vehicles will be weighed as they travel across the bridge and if detected to be overloaded, the sensors will automatically trigger the cameras to photograph the number plate of the vehicle and transmit data to UNRA’s central information system for follow-up. The Source of the Nile Bridge has a lifespan of 120 years and is located about one kilometre upstream of Nalubaale Bridge at Owen Falls Dam, which was commissioned in 1954. It replaces the old bridge whose lifespan was 50 years. Even though the now 64-year old Nalubaale Bridge has worked beyond its design life, Mr Omach said a structural integrity assessment will be carried out to determine if it can serve heavy traffic alongside the new bridge. The Source of the Nile Bridge is designed for speeds of 80 kilometres per hour. “This bridge will deliver traffic and improve cargo movement 16 times faster than the old bridge,” said Mr Omach. The bridge is fitted with laser lighting to illuminate the structure at night and during bad weather during the day — a safety feature that will also be a tourist attraction. According to the JICA president in Uganda Shinichi Kitaoka, the Source of Nile Bridge represents the latest technology in Japanese bridge engineering, and its unique characteristics will benefit the country and the region. Among the projects already being mooted for replicating this technology and engineering design is Karuma Bridge — also located along the Nile. Karuma Bridge is narrow and has become a black spot in recent years due to several fatal accidents. Transport infrastructure experts argue that the biggest deterrent to this technology is cost, but it should be used in the country’s roads to ease mobility, prolong lifespan and increase safety on the highways. Planning of the Source of the Nile Bridge had been on the cards for years, but began to take shape in November 2010 when the signing of exchange of notes took place, paving the way for a financing agreement in 2012. In January 2014, the groundbreaking ceremony was held, and Japanese contractor Zenitaka Corporation started construction of the bridge over a period of 48 months. However, the project took longer than projected by five months due to adverse weather, according to the UNRA board chairman. Mourners at the funeral ceremony of Dr Livingstone Mpalanyi Nkoyoyo were treated to a spectacle, when two Muslim doyens, Prince Kassim Nakibinge Kakungulu and Mufti of Uganda, Sheikh Shaban Ramathan Mubajje 'clashed'. The retired Archbishop of Church of Uganda, Nkoyoyo, who, passed away last week on Friday was laid to rest at the Anglican Martyrs’ shrine on Tuesday at Namugongo after losing a battle to cancer of the throat. The funeral, though not attended by as many people as expected (with so many seats remaining unoccupied), nevertheless attracted mourners from across the religious divide. Mubajje spoke for the Inter-Religious Council of Uganda (IRCU), which he chairs. He did not hide his disdain for Prince Nakibinge who is considered as the titular head of the Muslim community in Uganda. Mubajje didn’t recognise the presence of Nakibinge even though previous speakers had done so. As soon as the Mufti started speaking, Nakibinge was seen walking way. He only returned after Mubajje was done with his speech. Mubajje hailed Nkoyoyo as a true believer. He spoke of how he visited Nkoyoyo’s Rest Gardens Resort in Bweyogerere and found a signpost reading ‘Alcohol is not allowed inside,’. He said that he has heard tales of how profitable alcohol is to the extent that some Muslims sell it. Speaking immediately after Mubajje, Nakibinge instead recognised Mubajje’s rival, Supreme Mufti Siliman Kasule Ndirangwa as the true leader of the Muslim community. He indirectly threw a barb at Mubajje when he thanked the Anglican Church for preserving the sanctity of Namugongo by not selling it especially at a time when others entrusted with public properties have sold them for selfish gains. Mubajje commands respect within the Old Kampala Muslim faction while Nakibinge’s largest and most loyal followers are based at Kibuli. 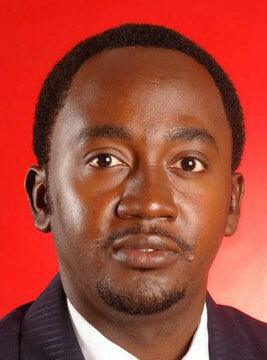 Mubajje, was in 2009 accused of selling Muslim land and other properties in and around Kampala. 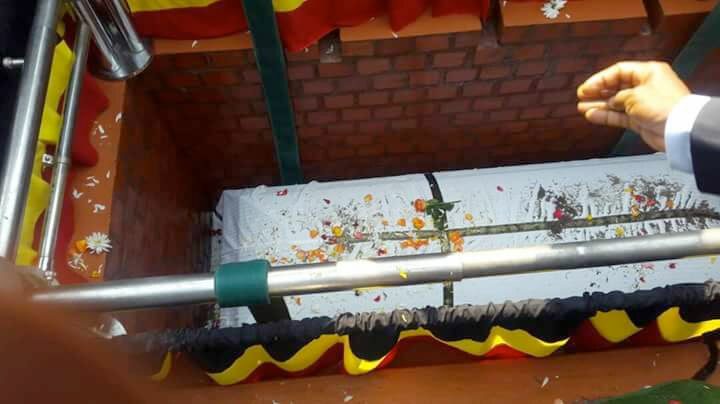 The funeral service started at 9am until 4pm when the remains of Nkoyoyo were lowered into his grave - a few metres away from the Uganda Martyrs Museum whose construction he has been spearheading. The burial was attended by among others, Vice President Edward Kiwanuka Ssekandi who represented President Museveni; Prime Minister Ruhakana Rugunda, Buganda Kingdom Katikkiro Charles Peter Mayiga; Buganda kingdom queen, Nabagereka Sylvia Nagginda; opposition strongman Dr Kizza Besigye; Leader of the Opposition in Parliament Winnie Kiiza and several ministers. Members of Parliament including, Betty Nambooze, Muyanja Ssenyonga, Kyagulanyi Robert Sentamu aka Bobi Wine, whose arrival excited mourners, were also present. 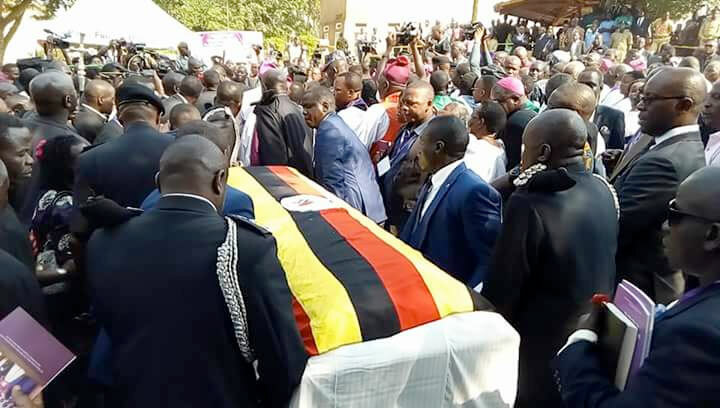 Meanwhile, the ‘war of words’ between the Church and the State was carried to Nkoyoyo’s funeral with Kampala Archbishop, Cyprian Kizito Lwanga asking people to be mindful and reasonable of what they do and say. Lwanga said the Church must speak because they are the conscience of the State. He called on the government to stop seeing them as enemies of the state. “I want to inform you that the church is not against the state…we must be reasonable in what we do and what we say… Politics, faith and reason are one and the same…,” Lwanga said. In his end of year message, President Museveni on December 31, castigated religious leaders for speaking out against the lifting of presidential age limits. He said that the clergy are “so full of arrogance” ready to comment on each and everything as though they hold authority. Lwanga, the most outspoken of the clergy in the current feud, said that nothing will stop them from commenting about issues affecting the country, adding that those who report to the president must do so truthfully without exaggeration for selfish interests. 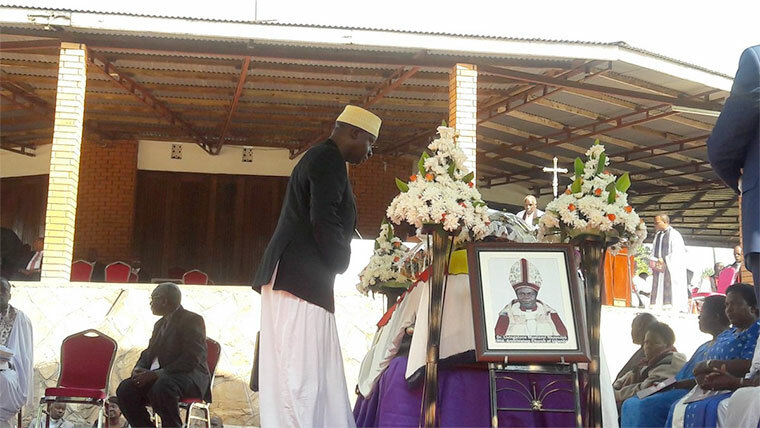 “People shouldn’t engineer the truth to suit their personal goals…,” said Lwanga, who is chair of the Joint Christian Council, amidst applause from the mourners at Namugongo. The Archbishop of the Church of Uganda Stanley Ntagali said parliament and other politicians must serve the interests of their people. He said the actions of politicians lately have showed that they work for, “God and my stomach, not for God and my country,” like Uganda’s motto says. Religious leaders have castigated members of parliament for voting in favour of lifting the presidential age limits in what many commentators have interpreted as a move done solely for President Museveni. The MPs also voted in favour of extending their current term by an extra two years. Nkoyoyo is survived by widow Ruth Nalweyiso Nkoyoyo, children; Isaac Mwesigwa Nkoyoyo, Naome Mirembe Ndiggya Kakembo, Martin Kagiri Nkoyoyo, Margret Nassiwa Ssesanga, and Julius Justine Kakumba Nkoyoyo. Dear the Clergy of the Church of Uganda, do not try to hide behind the bloody cross at Gesusemane like Peter. You have been great friends of the state for 30 years. The state has now told you that you are enemies of the state of Uganda. The modern African military officers under arrest in the Uganda Army. 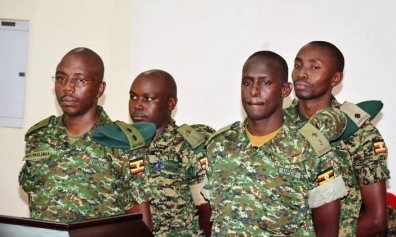 The officers at the rank of Lieutenant and Captain were this morning arraigned before the court which sat at the Chieftaincy of Military Intelligence headquarters Mbuya chaired by Col. Tom Kabuye. 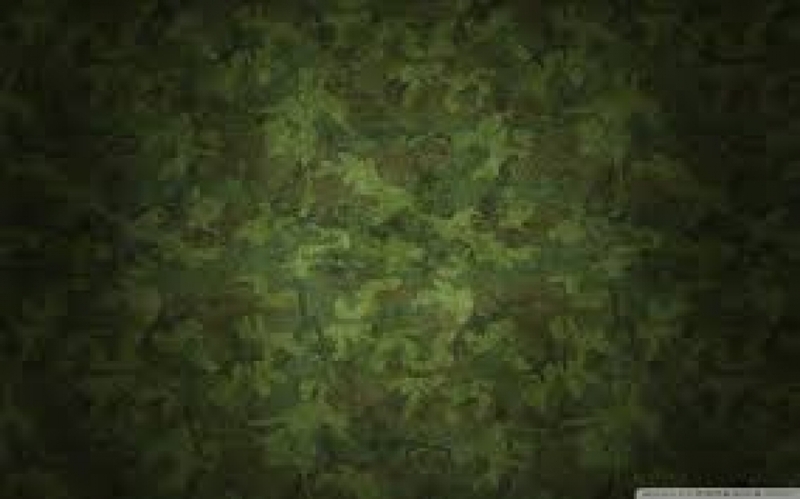 The Uganda Army African officers suffering it out for attending to modern internet technology. 51% of all South Sudan refugees are in Uganda, making Uganda one of the biggest host of refugees in the world. The United Nations (UN) refugee agency, UNHCR, has posted a 71% funding gap, saying for Uganda to cope with the refugee influx from South Sudan, $674 (about sh2.4 trillion) should be mobilized. According to the Uganda refugee response matrix on South Sudan, which UNHCR released on Tuesday, of the 1.3 million refugees in Uganda, only 834 have been medically screened, leaving hundreds in dire need of medical attention. The refugees that are concentrated in the districts of Yumbe, Arua, Moyo, Adjuman and Lamwo, include 1 million South Sudanese, 225, 755 from the Democratic Republic of Congo (DRC), 37, 349 from Burundi, 34, 963 from Somalia, 15, 031 from Rwanda and 20,763 from other unidentified countries. “61% of population (of refugees) are children under 18 [years],” the report notes. The South Sudan refugees in Uganda situation report adds that 51% of all South Sudan refugees are in Uganda, making Uganda one of the biggest host of refugees on the continent and the world. UN says that between the period of January and September 10, Uganda received 335, 312 new arrivals. The report has come at a time when the U.S has slammed sanctions on two South Sudanese government officials, a former army chief and three companies linked to the war lords in the conflict-riddled country. Since December 2013, when the South Sudan crisis erupted following disagreements between President Salva Kiir and former Vice President, Dr. Riek Machar, over two million people have been killed, while thousands have been displaced or forced out of the country as refugees. Regional efforts are underway to broker talks between the warring factions. The peace efforts led by President Yoweri Museveni with the guidance of the Intergovernmental Authority on Development (IGAD) and the East African Community (EAC). 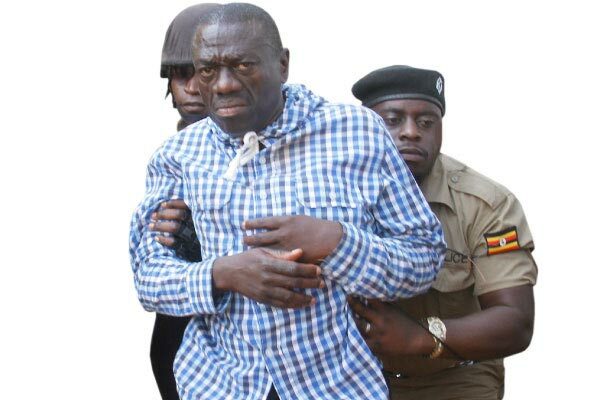 In Uganda, another judge has declined to take on Dr Besigye's many High Court cases. Kampala. Another High Court judge has declined to hear a case in which former FDC presidential candidate Dr Kizza Besigye is charged with defamation. The case was filed against Dr Besigye by Lt Col Ndahura Atwooki Birakurataki, the head of police Directorate of Crime Intelligence. Lt Col Ndahura alleges that Dr Besigye defamed him in 2012 when he accused him of murdering Mr Johnson Baronda in Rukungiri District during the 2001 election and was rewarded with a promotion thereafter. Justice Benjamin Kabiito declined to hear the case yesterday because he had not been consulted before the file was allocated to him. High Court registrar, Mr Alex Ajiji, said the judge could not handle the case because he was handling a similar one about the same person. “He is handling Dr Besigye’s case in which he is challenging his house arrest for 34 days now. He could not work on the two files at the same time,” he said. The case file was sent back to the court registrar for re-allocation. Justice Kabiito becomes the second judge to decline hearing the case against Dr Besigye. The case was first heard by Justice Steven Musota who later withdrew, saying he could not insist on hearing a case where one party was not comfortable with him. Lt Col Ndahura filed the suit in 2012, alleging that Dr Besigye in an interview with The Observer accused him of having murdered Baronda. He wants court to issue a permanent injunction restraining Dr Besigye from publishing any further defamatory material against him and also be awarded costs of the suit. Lt Col Ndahura also insists that the comments published by the newspaper attributed to Dr Besigye were false, defamatory and libelous for which he is claiming damages. Dr Besigye in his defence claims that the interview was published in public interest and that it was not intended to ridicule Lt Col Ndahura as purported. He also says he cannot retract his statement about the murder and promotion of the officer. The Uganda military Police is doing its work of stopping demostrations of the opposition. ENDAGAANO ZA BUGANDA KIBI NTI ZIKOLEBWA KIRO MUKYAMA! Amid the euphoria that greeted last year’s agreement – then called a memorandum of understanding – between President Museveni and Kabaka Ronald Mutebi, critical observers warned that the real test lay in implementing it. And at a closed-door meeting with Buganda MPs on Wednesday, Katikkiro Charles Peter Mayiga spoke about his frustration with government’s reluctance to translate the ink on paper into reality on the ground. The agreement returned many ancestral properties to Buganda; but speaking out openly for first time since the agreement was signed on August 1, 2013, Mayiga told the MPs at Bulange, the seat of Buganda kingdom, that he had written several letters to government officials which had been ignored. And on the other occasions, he said, he has offered to meet with the relevant government officials but has always been tossed around. “But when issues to do with the [likes of] Mwogeza Butamanya [Buruuli chief] come up, they are quick to invite me and ask me how to go about them,” Mayiga said. “If they are saying that there are contentious issues relating [to the rebellious chiefs], why are they [government] not implementing the other issues that are not shrouded in controversy?” Mayiga wondered. The closed-door meeting was followed by a one-hour open interaction attended by journalists and other kingdom staff. At least 30 of the 99 caucus MPs attended. The katikkiro’s delegation included kingdom Attorney General and Local Governments Minister Daudi Kisitu Mpanga, Spokesman Denis Ssengendo Walusimbi and Gender and Bulungibwansi Minister Christine Nagawa Kasule. The MPs, in their memorandum read earlier by the caucus Chairman Godfrey Kiwanda (Mityana North), had urged Mayiga to explain the contents of the agreement. “When we came here last year, you said you could not give us its [agreement’s] details until you had presented it to the Lukiiko [Buganda Parliament],” Kiwanda said. “Since then, we have not heard from you. What is in that agreement? What have you achieved? What has failed? Is there a way we can help?” Kiwanda asked. Mayiga revealed that government had paid an additional Shs 2bn out of the Shs 20.3bn in rental arrears owed to the kingdom. “There are a lot of issues [in the agreement] that government is still silent about. For example, we gave them [government] our valuation figures for the properties they are supposed to compensate us for but we have not heard from them,” Mayiga said. He later told the MPs that he was planning to meet President Museveni over the matter. In the past, Mayiga said he feared to speak out openly about the agreement because he didn’t want to be accused by government of breaching the agreement. According to the agreement, government is supposed to compensate the kingdom for confiscated ancestral properties such as Muteesa House in London that the kingdom has valued separately at £5m (Shs 21.5bn). Other properties include four Rolls-Royce cars that belonged to Sir Edward Muteesa II, Plot 52 Kampala road, in addition to chunks of land in Kampala’s industrial area and major police stations. 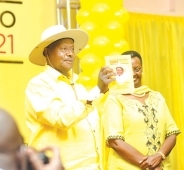 “They have remained mum, we don’t know whether they are in agreement with our valuations or not,” Mayiga said. He said government has up to the end of the current financial year (June 30, 2015) to clear the balance of Shs 16bn of the Shs 20.3bn rental debt. Unfortunately, Mayiga told the MPs that the agreement spells out no remedies in case government reneged on its obligations. “I believe you also have a duty to help us demand for these things because we had hoped that within a year, government would have fulfilled what was agreed upon,” Mayiga said. Kabula MP James Kakooza suggested that the MPs should push government to include the money in its next supplementary budget requests. 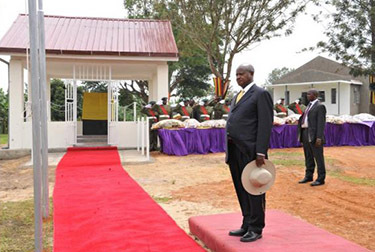 The August 2013 agreement stirred a lot of controversy among Buganda loyalists. 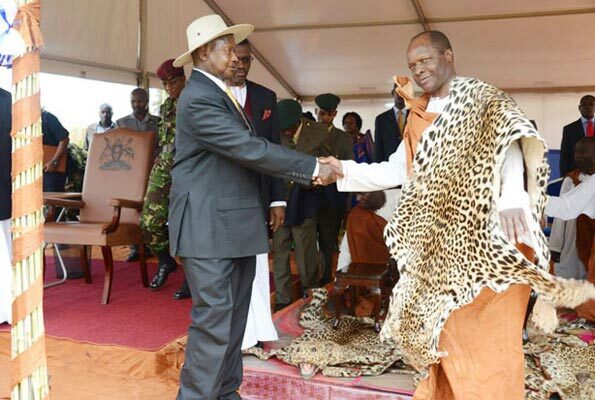 Last August, some Lukiiko members petitioned the Kabaka Ronald Muwenda Mutebi II, urging him to prevail over Mayiga to let the Lukiiko debate the agreement. It remains to be seen whether that will happen. Mayiga also asked the MPs to use the current constitutional amendment process to renew Buganda’s agitation for a federal system of governance. Mayiga told MPs that the kingdom had chosen to ignore the kingdom’s “rebellious chiefs”, notably Ssabanyala Maj Baker Kimeze, Ssabaruuli Mwogeza Butamanya and Kooki’s Kamuswaga Apollo Ssansa Kabumbuli II. He branded them as opportunists who are making outrageous demands to cause unnecessary debate. “A person like Mwogeza Butamanya has less than 1,000 followers in Buruuli against the Kabaka’s more than 100,000 followers in the same area, that one should not bother us,” Mayiga said. He made reference to clause 1(IV) of Section B of the agreement that requires the Kabaka to respect the cultural norms of other related ethnic communities in Buganda. He said that clause does not declare anyone king besides the Kabaka. “We didn’t take this clause as a serious issue because long before the coming of colonialists, Buganda was a collection of tribes, it was a nation state, and no one can teach us how to respect other communities living within Buganda,” he said. The MPs cautioned the Katikkiro against continuing with his fundraiser (ettoffaali) without the kingdom helping its people to climb out of poverty. “You should devise means of empowering the people economically; otherwise, they are fed up, in the end, the fundraisings will chase them away from the Kabaka,” Syda Bbumba (Nakaseke) said. Bbumba was supported by Amos Lugoloobi (Ntenjeru North) who opposed Mayiga’s focus on coffee. He suggested that the kingdom should instead redirect its efforts to replanting bananas. Two protestors shot dead in Burundi clashes over the coming National Election in this small African country. Policemen (R) patrol as protestors take cover in Cibitoke on April 26, 2015.
witnesses said, as protests escalated over a bid by the president to seek a third term. Two protestors were shot dead on Sunday in clashes with police in Burundi's capital, witnesses said, as protests escalated over a bid by the president to seek a third term. Clashes erupted in several parts of Bujumbura the day after the ruling CNDD-FDD party, which has been accused of intimidating opponents, designated President Pierre Nkurunziza as its candidate for the June 26 presidential elections. Opposition figures and rights groups say the president's effort to cling to power is unconstitutional, and there are fears the worsening crisis could plunge the African Great Lakes nation -- which only emerged from long and bloody civil war in 2006 -- back into violence. Independent eyewitnesses said one person was shot dead in the city's Ngagara district and another in Musaga after police used live ammunition to disperse crowds who defied a government ban as well as warnings that the army could be called out. One body was left in the streets while another was taken away by Red Cross workers, several witnesses said. "We had called for peaceful protests and that is what happened, but the police and ruling party militia fired real bullets at the protestors," said a Burundian opposition leader, Frodebu Leonce Ngendakumana. 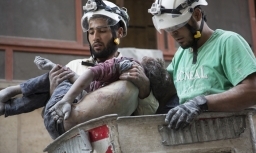 Local media reports added that several more people have been wounded in the city, while several police have also been hurt in stone-throwing while trying to prevent thousands of youth from marching to the city centre. Tens of demonstrators have also been arrested, witnesses told AFP. Burundi's Interior Minister Edouard Nduwimana condemned what he said were "uprisings called for by certain politicians and civil society". Burundi's ruling party members attend a congress at which President, Pierre Nkurunzinza was nominated for presidency on April 25, 2015 at the capital Bujumbura. Burundi's president has been declared on April 25 as candidate for a controversial third term in office, his ruling party announced, despite mounting protests over a move that the opposition says is unconstitutional. The independent and influential African Public Radio (RPA), which has been for months reporting on government intimidation of opponents, was also threatened with closure unless it halted live broadcasts, officials said. Tensions in Burundi have been mounting for months with Nkurunziza -- a former rebel leader, born-again Christian and football fanatic -- laying the groundwork for a third term. Burundi's president has been declared on April 25 as candidate for a controversial third term in office, his ruling party announced, despite mounting protests over a move that the opposition says is unconstitutional. Opposition groups say a third term would violate the constitution as well as the peace deal that ended the civil war. The influential Catholic Church has also spoken out against the president's plans to stay put, and earlier this month UN rights chief Zeid Ra'ad Al Hussein warned that the country was at a "crossroad" between a fair vote and a route back to its "horrendously violent past". On Saturday Washington condemned Nkurunziza's candidacy and warned the country "is losing an historic opportunity to strengthen its democracy." "We specifically call on the Burundian government to respect the rights of all peaceful political parties and their candidates to campaign, hold meetings and rallies and express their views," the State Department said. Thousands of Burundians have fled the country in recent weeks to neighbouring Rwanda and Democratic Republic of Congo, according to the UN's refugee agency, which has also warned that the numbers of refugees could swell "with more political tension rising and more acts of violence being reported." Many are fleeing threats by the pro-government militia Imbonerakure, the youth wing of the ruling CNDD-FDD party. Rights groups allege that the militia has been armed and trained over the past year in order help Nkurunziza stay in office. The story of Prof Mutebile’s ill-health is common place. The man responsible for managing Uganda’s economy is under-going treatment in South Africa. But what is it really that is weakening the jolly and internationally renowned economist? The answer is right here in these pages. Just concentrate on reading. Concerned pals of Mutebile, some of them fellow economists, doctors, working in Bank of Uganda and in government, opened up about their friend’s heavy drinking habits. They say it must be the reason why his health is degenerating. “When he gets inside the bar, Mutebile forgets anything to do with eating. He attacks booze with Red Banton’s thirst and imbibe it with Gen Kahinda Otafiire’s concentration,” our informer within Mutebile’s circles report. 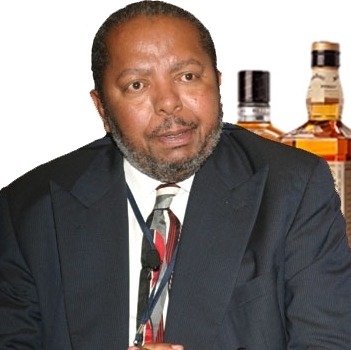 On a good day, our informers narrate how Mutebile can drown two to three gigantic bottles of Red or Blue Label Whisky. To make us understand clearly how heavy a drinker Mutebile is, our informers likened him to presidential advisor, John Nagenda. Old John is another dedicated fan of heavy whisky brands. One of high end Ugandans, who knows Mutebile very well, says he normally takes his bitter at Mosa Courts Apartments. Mosa Courts are owned by the NRM second-in-command, Hajj Moses Kigongo. He also drinks at Grand Imperial. This is when he has to attend Kampala Rotary meetings. The governor is a member of Rotary Club of Kampala Arch. When meetings have ended; he goes straight to Copper Bar. This bar is patronized by loaded members of society. Once inside, he finds his serving of whisky already done by waitresses. Then, he gets down to work at hand. A journalist, who has covered functions that are attended by Mutebile, offers how organizers never miss to reserve whisky for the governor. He recounts how Mutebile has been employing a youngman lately to lift his leg, while the governor is getting out and inside his luxurious bullet-proof limousine. “The youngman walks by Mutebile’s side just in case he slips to move faster and help him maintain balance,” reports the journalist. Looking at the governor at close range, the journalist offers, shows a man whose skin is dry and pale, for person of Mutebile’s wealthier status. Now medical doctors approached for this article warn of how heavy alcohol brands, taken on an empty stomach, can end up seriously affecting the partaker’s internal organs such as the liver and kidneys. “Alcohol taken in large quantities over a long time takes its toll on the liver and kidneys. Those organs sieves poison what we drink and feed on. Once one drinks heavily, the organs get overwhelmed by poison. What follows is that the heavy drinker’s internal organs lose the body to eliminate poison and it accelerates his death,’ doctors warn. The professionals have talked. We have nothing useful to add, but to hope that the governor is taking heeding. 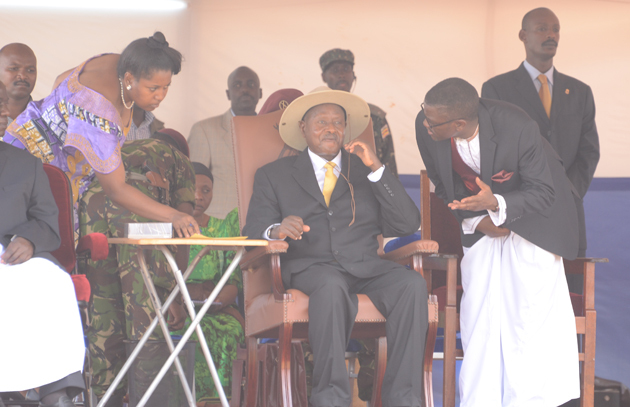 The President of Uganda greets the King of Buganda. is involved in becomes instantly contaminated and quickly atrophies. >>> Best Kemigisa to stop interfering in the kingdom administration. 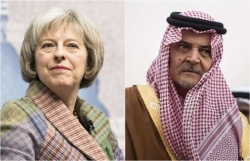 >>> leadership crisis in the Kingdom. >>> with plans for his coronation. >>> and told Kijjanangoma to stand up and respond to the accusations. >>> which led to the death of more than 90 people. >>> him in the conflicts. 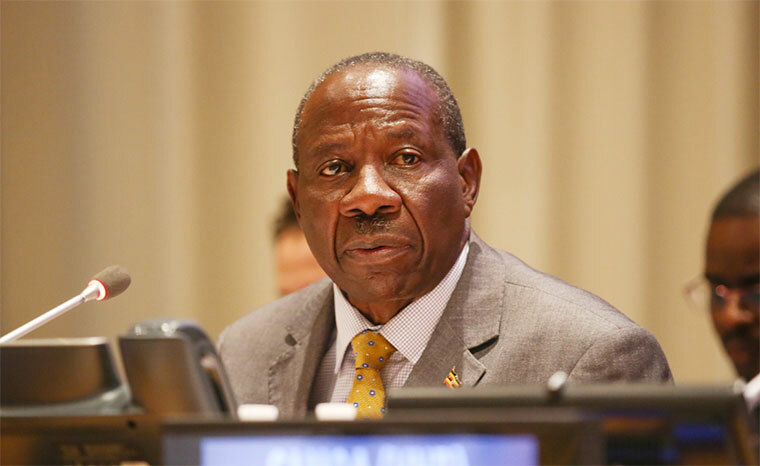 Government is doing a lot of business with foreign firms and individuals, who, once paid, quickly repatriate the money to their home countries and offshore accounts, Finance minister Matia Kasaija has said. And this problem of capital flight, is greatly affecting economic activity and growth in the country according to the minister. Kasaija was speaking at a public policy dialogue on revisiting the tax regime at Uganda Management Institute. Kasaija, a golfer, told the attentive audience that about a year ago, he visited Uganda Golf Club and was shocked with the poor attendance by its members. Kasaija said even the few members who went to the golf club, spent just a short time, spent less or nothing and hurriedly went home. Concerned, Kasaija said he instituted a private research to find out what was happening with the once liquid club members. He declined to divulge his findings to the dialogue participants. But when speaking with journalists outside the auditorium, minister Kasaija revealed that the real cause was that the golf club members had little money to spend because government has been doing a lot of business with foreign firms. According to Kasaija, whenever they released funds every quarter, the bulk would go to these foreign firms and individuals who quickly repatriated the money - leaving Ugandans with very little disposable income. "Do you know that most of the projects in Uganda are being done by non-Ugandan companies and that means that when I pay them, most of the money is gone…The solution you find it out yourselves...Much of the money is taken by companies outside this country so there’s therefore less money going into the pockets of Ugandans." Kasaija said. Capital flight, in economics, occurs when assets or money rapidly flow out of a country, due to an event of economic consequence. This leads to a disappearance of wealth, and is usually accompanied by a sharp drop in the exchange rate of the affected country like depreciation in a variable exchange rate regime. Most of the foreign companies operating in Uganda are from China, India, other Asian countries and Europe. The true extent or percentage of government cash releases that go to foreigners is not clear but should be huge. Kasaija also admitted that there's a lot of theft and wastage of public resources and urged Ugandans to put to task government to show what their taxes actually do. He said without fear of contradiction, he sees a lot of wastage of public resources. There are sectors, he said, that seek for Shs 5 billion to organise an unnecessary conference. "Some sector comes and the accounting officer comes and says; I need Shs 5bn to hold this conference. We have cars around, then he’s talking of hiring cars, we have free halls then he’s talking of Munyonyo to go and spend another Shs 1bn on hiring - not that am envying my brother who owns that facility but cut your cloth according to your size." Kasaija also said, rather opposing taxes such as the mobile money tax, Ugandans should instead demand for accountability as no country in the world can develop without taxing its citizens. This long term ruling goverment must resign so that the next government is able to negotiate for better terms of state economic management with the HIPC programme. There is the imposing building at Kawempe. After about a year of construction work, the Kampala Capital City Authority (KCCA) hospitals at Kiruddu and Kawempe – expected to decongest Mulago Hospital – are near completion. Dr. David Serukka, the director of Public Health at the authority, said the hospitals which will cost $30m, will employ 900 staff, mainly nurses and midwives plus specialist paediatricians, gynaecologists, obstetricians, surgeons, nose, ear and throat doctors etc. He said the facilities will be fitted with 170 beds, each. They will offer both inpatient and outpatient services. They will not be specialised to a level of medical research, but they will offer X-RAY, CT scans and services for pregnant women, under-five children, and traffic accident victims. Infrastructure works for the two facilities are expected to conclude January 2016, according to the authority’s deputy spokesperson Robert Kalumba. Thereafter, equipping of the hospitals will commence. The actual opening is expected “sometime towards the end of March (next year)”, said David Serukka. Some of the fine raised Hospital buildings without modern lifts. But what facilities the two hospitals are. They may not be complete yet. But they are grand facilities, expected to improve healthcare delivery in the city. The facility at Kawempe is located just along the busy Kampala-Gulu Highway. Just like is the case with Kiruddu Hospital in Makindye division, the hospital at Kawempe sits in a middle of a heavily populated slummy neighborhood. Richard Ayebare, a resident near the facility, said it will “help many” when it opens. Dr. Asuman Lukwago, the health ministry permanent secretary, said in May 2013, when he announced that government had received money to build the two hospitals, that the addition of the health facilities would improve delivery of health service in the city “by offering options from the present only government referral hospital at Mulago”, which he said was flocked by hundreds of patients every day. Dr. David Serukka said the hospitals were at a level “between a general and referral hospital”. They will receive cases referred to them from lower Health Centre III’s and IV’s. From its rooftop, the hospital at Kawempe is a block overlooking the surrounding Bwaise and Kawempe slums and Kazo hill to its West. The 10-floor building has an incredible view from its rear, more like a three-in-one tower. It has some annex at the back; and a typical wide landing at the reception. The inside is rectangles of rooms and staircases and lifts. The hospital is inside perimeter walls. The strip glass curtains at some of its sections make its exterior exceptional. Perhaps, its only undoing is a location very close to a busy highway and the facility will likely suffer noise and dust pollution. And, it doesn’t have ample compound. China National Aero Technology won the tender to construct the hospital. The project is funded by a loan from the African Development Bank and Nigeria Trust Fund. The members, who took oaths before the minister for Information and Communications Technology, John Nasasira, in Kampala on Wednesday, will serve for three years. Nasasira asked the board to internalise the UCC Act 2013, under which they were appointed, in order to dispense their obligations effectively. “Although the ICT sector has grown, there are still many challenges that you have to handle so that the consumers get a good deal from the commission,” Nasasira said. Some of the tasks ahead for the board include regulation of the unfair distribution of internet bundles by service providers, supporting the ICT strategic investment plan 2015-2020, promoting untapped local content and extending internet services to rural areas, according to Nasasira. He commended UCC staff for successfully running the affairs of the commission even without a fully-constituted board for more than two years. The new board, chaired by Dr Vincent B.A Kasangaki, has members Evelyn Gloria Piloya (social worker and representing persons with disabilities), Jane Francis Kabbale (banker), Wardah Rajab Gyagenda (researcher), William Byaruhanga (lawyer), Norah Muliira (ICT specialist), Eng Charles Lwanga (staff, ministry of ICT) and Godfrey Mutabazi, the UCC executive director. Kasangaki said the board would advise government on the communication sector with utmost diligence and commitment. “We should be able to talk intelligently and with comfort and confidence about pertinent issues when [we] interface with the general public,” Kasangaki told his members. Limitless Presidential Terms do not solve many of African problems either. Presidential Limitless Terms in African Republican states escalate these problems. These are Republican States that are creating Emperors on the continent of Africa and thus subsequent civil wars. Mr Kagame changes the tune: "Term limits cannot solve Africa's problems"
Six Ugandan journalists visiting Rwanda on Thursday and Friday attended President Paul Kagame’s rallies in two remote districts. On their way back to Kigali they had a brief meeting with him at Karongi district headquarters. David Mukholi and Raziah Athman, who represented Vision Group, bring you excerpts of the interview. QUESTION: For the last two days when meeting people in Rutsiro and Karongi districts, people raised issues concerning them but prominent among them was the call that you run for president in 2017. How do you feel when such calls are passionately made? ANSWER: What is more important to me (and maybe that is the reading people should have had) is not that people want something for the sake of it. It is because of the benefit. It is not about somebody’s good looks. This person maybe has delivered something. You saw the women and men talk about their journey in their lives. They tell you how it has happened. The question of how do I feel. First, of all I must tell you I did feel good about it from the sense all of us are part of this transformation that is happening. It is not just me, because it can’t be me alone. The others who utilise the opportunities and resources and change their lives have to be there. It is not the good story that I have told them, not my presence and kinds of lectures I give them. In the end if they go back home and don’t do things themselves nothing will happen. We share credit across the board. Those who implement and realise the difference deserve the credit because they could choose to sleep and do nothing. It is a good feeling I think for everyone, including myself and the country. It is a question of how we contextualise it. If you look at where Rwanda is vis-à-vis others, meaning developed and even middle-income countries you start wondering where we have been. We feel challenged and feel we want to do more. There is no doubt at one point I will be very clear myself where I stand and what I intend to do. There is no hurry, 2017 is slightly over two years to finish this mandate. What follows after is something that will come out sooner or later. It has a context; we will see. I have not allowed any pressure on me to say where I stand. Of all problems I have faced in my life this is not a very different one. I have had complicated ones. I have dealt with more complicated challenges than making a decision to pronounce myself on this. Are term limits good for Africa? There are too many things said about it; in my view many times, exaggerated. I don’t think the problems Africa faces have anything to do with one thing: term limits. I don’t think the problem can be solved by term limits, neither, I would I say term limits are a solution to Africa’s problems. As you saw, when we were talking to the masses, the poverty, hunger they have and readiness to bring up solutions is not related to term limits. It may be related to politics but not to term limits or no term limits. It is related to politics, which politics can and do go wrong whether you have term limits or not. If we say no term limits, will you not find problems? What has to be done is completely different. Have we managed to put in place institutions that define us and serve us beyond this single discussion of term limits? Creating rule of law, parliament that functions, civil society and private sector doing what they should do. Do we have government in places that are responsive to people’s needs beyond thinking about these term limits or no term limits? Term limits have nothing to do with democracy. Because the proponents of term limits argue that if you overstay you get drunk with power. Yes, that is part of the problem but not the main problem. Look at Singapore. Lee Kuan Yew was there for 32 years. What he managed to do for his people is incredible – transforming his country from a third to first world. If term limits had been the solution, I don’t know. I am not sure. Even those who said all kinds of things about him when he passed away, they have good stories about him. When he was there he was being bashed all the time, I think he ignored it and concentrated on delivering; making sure transformation takes place. In other places I have heard people saying, if I am elected for the second term I want to go for the third. But I will ask why? If limiting yourself is democracy, then why go for the second term why not finish the first and say I am done? If the shorter time you serve the better the legacy is, then why don’t people do that? Let us look at Nelson Mandela, he was a wonderful person for different reasons. The question is, if he left after serving one term and if you want to emulate him, then even those with term limits shouldn’t have two terms they should go for one term and just serve and go. The arguments for term limits are sometimes confusing and convoluted. People put personal emotions than certain realities that are how things break away from the context. We as African leaders should think about the people we lead. I have some kind of anger; we can’t continue to be under the load for all these decades with all the resources the content is endowed with. And just continue with the names of poverty, disease and conflict. Why should that happen; is it because people have not observed term limits? No. In some places in Africa, term limits are observed but has it helped? I don’t think so. So, therefore, what is the obsession with term limits? Even if it is a good thing, it is a good thing in combination with other things, it is not something that stands alone. The context and substance are important. Sometimes people are singing these songs from outside. Professors of democracy are good at being professors but not executing it. But there could be and there are some merits in limiting terms of service in a flexible way to act as those things for checks and balance. But if you check and don’t balance you have a mess. While addressing opinion leaders in Karongi district on Thursday night, you mentioned a country that is accusing Rwanda of stealing minerals; which is this? It is not a matter of saying, which country. It has been in the newspapers anyway. Some of the countries in question who talk about it are those neighbours who say we have exploited their resources. But then there are others who exploit those resources who also start saying this. You don’t know how much we have gone through to try to prove. For example, coltan is the mineral used against Rwanda for political reasons, saying we get it from Congo and we don’t have the mineral. That is a fact. We have brought representatives of these countries and journalists to visit the mines where the coltan comes from. They found people making money from it but when they go back they accuse us of the same thing. Rwanda’s coltan is better quality than any in the region including the Democratic Republic of Congo. But because they want to write different stories they have framed a narrative about Rwanda. In Congo, it is not about FDR; forget that the international community created a force on that basis. One hand they say they are 20,000 then another that they don’t exist. They say these people are just there to exploit. They have now been exposed and people, if they continue with it, will get to see the truth and they will start losing their credibility. You hinted at the gas in Lake Kivu and plans to generate power and considering starting the project? We are launching it at the end of this month. We have a lot of methane gas but we have opted to convert it to power generation. The process is complex. Methane gas is mixed with other gasses underwater. So, we shall extract all of them, separate them and retain the methane which we shall fire for electricity generation. Then return all the other gases into the water. Contour Global, the firm we have contracted, is trying to do this so as to keep the lake secure by avoiding any imbalances. We are going to have production starting with 25MW. This means, if we get it, then the technology is working; then it is a question of scaling up. On the East Africa Community, especially the Northern Corridor infrastructure development. It seems Rwanda and Uganda are lagging behind as Kenya moves ahead. I will not characterise it that way yet. Kenya had something existing, while between Uganda and Rwanda there was nothing existing so we have to create something from scratch in terms of railway and so on. The process is also complex involving mobilising resources, carrying out studies and organising significant amounts of money. Yet we are not about to invest in infrastructure and forget other areas. This is the challenge too. But I am happy that this whole thing started. It is a good step that we agreed to work together. It is something important. As chairman of the Africa Union, President Robert Mugabe recently said African leaders put a yoke around their necks by having term limits and later trying to change them by justifying their actions. Its seems you are using the people to ask and not like your counterpart in Uganda? Yes. I am not telling anybody to ask. If they asked me a different thing, I will respect. If many say you need to rest, I would say thank you so much. Let me argue for those others (not my case at least not yet); those others who put term limits in their constitutions and changed them because there is nothing that can’t change. Which part of the world has never tampered with the constitution? We put something in the constitution because it served a purpose at the time. But every tampering is not correct because some can change because they want to serve some causes that are not justified, just for things that suit them. This should not be for every case. We can take case by case and see which some have changed for a bad reason and those for good reasons. It is also possible that for those who put term limits in the constitution maybe it was on a wrong premise, under influence or pressure. We live in a not so black and white world, things many times are grey. May be in the beginning when they put them in the constitution they didn’t think much about what they were doing. They were told what to do, whatever pressure, they just went with the fashion. Maybe they thought it was a good thing they tried and it served them for a time then released they need some adjustments when they found it unnecessary. This President-public interaction: Why did you initiate it and how good is it? Given the history of this country, people are patriotic and they love their country. What have you done? I will start with the second question. I don’t think patriotism is to be pushed down people’s throats. They become patriotic if they want to. We give them a message, we explain it around things they can do and benefit from. With these illustrations and explanations. Of course, things are being done that benefit them. Then out of the interaction the message goes down very well and patriotism becomes a reality. You must not ask people to become patriotic. It is a complex situation – interaction, illustrations sharing of lessons that people who want to make a difference; this amounts to a whole country changing for the better. It takes a time of its own. Only keep messaging to keep the fi re going. The people then get together to fight anything that undermines the progress as a country. On accountability we are conscious, if we use the normal process from point A to F, a great amount of truth will be lost. Or so many things will be added to the truth, giving it a different colour. It is important to have this system running but support that with direct contact, interaction and interventions. Then you get to know what you have been feeding on is not always the truth. That is when you call people in the open to account. The good thing about it is someone caught in it will not repeat it and others who are witnessing will not be involved. They leave not wanting to get involved because they know someone standing before a crowd shown how guilty he is, is a bigger punishment than sending people to prison for 10 months. Public accountability is a way of exposure. It is a good lesson, without hurting everybody. It is corrective as well as educative. Where do you want to see Rwanda in 10 years from now? Let me start from the other end. A prosperous country where poverty is not something that is our main preoccupation to deal with but rather our children have gone to school and acquired skills, advanced in technology, part of our way of life, incomes of families, a middle-class that being the minimum for the majority of our population which is that of the middle class level. Of course there will be nothing if society is not stable. Rule of law and security are paramount. We can’t make these gains without security. Twenty years from now I want to see GDP per capita as high as a couple of thousands. And Rwandans as happy as anyone wants to be. At least it is possible. I think some decent progress has taken place, which is good. Can we do more? Of course, as the population increases, it brings with it more challenges. For every five or 10 years come challenges on top of the previous one, if they have not been addressed. I foresee more challenges come when you have more tools to deal with them.